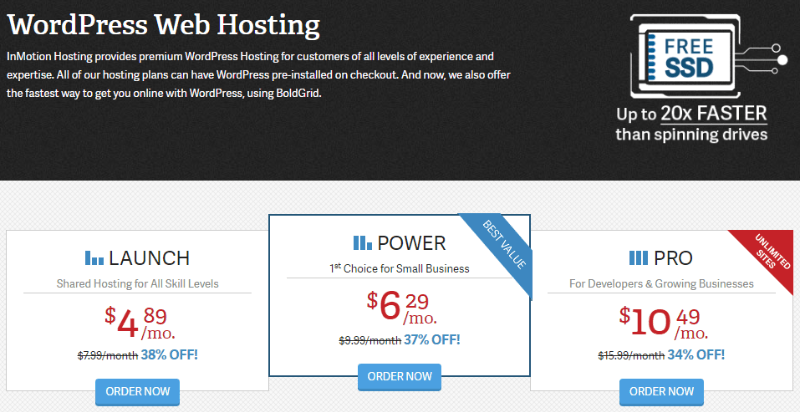 SiteGround is one of the most popular WordPress hosts out there, mainly because they offer very affordable managed WordPress hosting. Because I’d been reading so many positive SiteGround reviews, I decided to move five of my smaller sites to SiteGround to test it out. After using it for some time, there was a lot to like. The SuperCacher is excellent for speeding up your site, and SiteGround’s customer support is great. 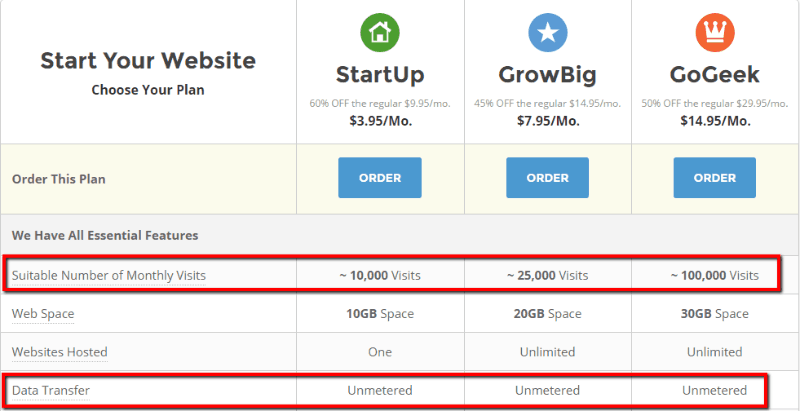 In this post, I’ll tell you a bit more about how this limitation can affect your site, and then give you some of the best hosting alternatives for SiteGround. You may be wondering how traffic is limited with “unlimited” data transfer. The answer is CPU seconds. While SiteGround doesn’t impose a hard cap based on those monthly visit numbers, they will throttle you if you exceed your number of allotted CPU seconds, (aka “executions”). What is a CPU second/execution on Siteground hosting? So while you can include as many images and videos as you want because of the unmetered data transfer, you’ll still be limited by the number of people who load your WordPress site’s .php files (aka visit your site). If you’re only running a medium-traffic WordPress site or a type of site with low executions but high data transfer, you’ll probably be fine with SiteGround. But if you’re running a site that gets lots of traffic, those executions can quickly add up and severely limit your account. So, if this sounds like it might cause an issue for your site, I’ve put together a list of some of the best SiteGround alternatives you can consider using instead. The Best Alternatives to SiteGround Hosting? I hosted my sites with Cloudways for four months before switching to Kinsta (another host I’ll recommend on this list). Cloudways is great because they let you take advantage of hosting infrastructure from some of the biggest technology companies in the world. You can also choose the data center which is nearest to your readers to speed up your site’s load times. They have a helpful interface that makes it easy to install WordPress. But you’re not limited to WordPress; you can also quickly install Joomla, Drupal, and other apps as well. Choose your own cloud technology. Helpful interface for managing/setting up websites. Affordable prices – plans start at just $5/month on DigitalOcean. You can scale your plan up and down in real time as needed. Plenty of power for large sites on more expensive plans. The large number of customization options (like which cloud technology to choose) might overwhelm beginners. Kinsta is an amazing managed WordPress host. It’s where I currently host ShoutMeLoud and I’m definitely happy. But it’s also one of the more expensive SiteGround alternatives, so I really only recommend it for high traffic sites that need maximum performance. If you’re just starting out, pick one of the more affordable hosts on this list like Bluehost or InMotion. All of Kinsta’s plans offer unlimited traffic/visitors, but their plans do have a bandwidth cap, so you’ll want to make sure you pay attention to how much bandwidth your site uses when picking a plan. They utilize the Google Cloud platform, so you’ve got some of the best infrastructure available powering your site. And finally, Kinsta has great support if you ever need help. When I was having some issues moving ShoutMeLoud to Kinsta because of old WordPress plugins, the Kinsta CEO himself reached out to help me get my site working right. No direct cap on visits. Though their pricing is fair, it’s out of reach for beginners. One reason it’s especially great for beginners is their included BoldGrid WordPress website builder tool. This tool will help you set up your WordPress blog, even if you’re a total beginner. All of InMotion Hosting’s servers have SSDs, which means they’ll perform up to 200% faster than other hosts who use HDDs. Their plans start at just $4.89 per month and all include unlimited storage and bandwidth. BoldGrid website builder makes it easy for beginners to get started with WordPress. Not really suitable for high traffic websites that need top performance. 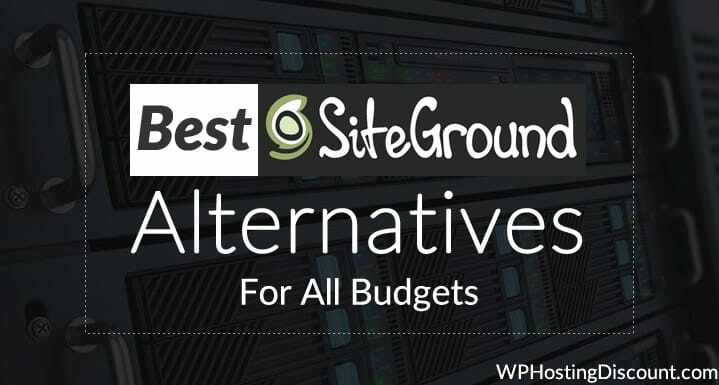 Which SiteGround Alternative Should You Pick? If you’re looking for a host which can rival the affordability and value of SiteGround, you should consider DreamHost or InMotion Hosting. Whereas if you’re looking for the host with the absolute best performance, you’ll certainly want to pick Kinsta. And finally, if you want an option that’s in between those two extremes, Cloudways is a good alternative. Do you have experience with any of these hosts on this list? Would you recommend another SiteGround alternative? Let me hear your thoughts in the comments below! 1 The Best Alternatives to SiteGround Hosting? 1.1 Which SiteGround Alternative Should You Pick? Your post always impress me and you giving best hosting for me. I hope Siteground best for hosting and I using this for my blogs. However, your alternatives no nice. Good Morning. What’s your opinion about Namecheap for a Viral Blog with many visitors ? I am always surprise when I read your post. Your a best blogger and I always follow you. I love Blue host for wordpress. Do you agree with me? Thanks for your kind words. Bluehost is indeed a good hosting. Hey Harsh I am using Hostgator. Is that Good for Small Blog. Previously I was using Siteground, undoubtedly it’s good web hosting. Now, my blog is hosting on Cloudways with Digitalocean cloud network. I can say it is better than Siteground. Thanks Harsh for these options. I use Siteground on some of my blogs, but considering now to try out Kinsta.